Do you have a deck that’s in need of some storage? Have you thought about buying a big deck storage box to help out with that? What are some reasons why you might be interested in an extra large deck box 200 gallon size, anyway? Many people enjoy using deck storage boxes because they can provide a lot of extra room to keep items that are safe for outdoor storage. This is especially nice when you’re trying to store items that you’d want to use on your deck in the first place, like gardening equipment or cushions. In this article, we’ll introduce you to a great deck storage box that’s big enough to hold more than a lot of the other options out there. This product is a durable and high-quality solution to storage needs, whether you’re planning to use it on your traditional deck or beneath your RV deck instead. When you bring home this product or one like it, you’ll be able to enjoy tons of great storage solutions without having to worry about whether or not your items are safe. So let’s get started! With the Keter XXL Plastic Deck Storage Box, you can enjoy tons of space to store anything you might need to keep outdoors on your deck or even outside your RV. This box is a 230 gallon deck storage option that is spacious enough to hold tons of gardening items, outdoor decor and accessories, and anything else you might be looking to keep safely tucked away when you aren’t using it. If you’re looking for something that can hold up to use in inclement weather and give you all the space you need and more, this is a great product for you. 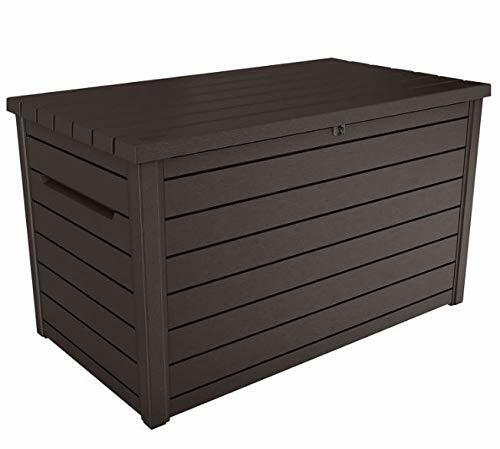 This deck storage box comes in an attractive dark brown color that matches just about any type of decor you may have in your backyard or on your deck already. The lid features a piston opening design that makes it easier to lift it and keep it open until you need it to shut. This deck box is fully lockable and is easy to lock and unlock quickly when you need to get into it. The texture of the box is designed to look and feel like wood, but it is made of durable resin that is UV-resistant and waterproof as well. This deck box is large and heavy enough even without anything inside it that it won’t be easily blown around in the wind, even in storms. We love the overall capacity and ease of use that comes with this deck box. This box is easy to operate and it gives customers peace of mind knowing that their items are stored safely away from weather, pests, and intruders as well. The design of the box is very simple but it gets the job done efficiently, and the box is more than large enough to hold lots of outdoor items. Many customers report being able to keep all their seat cushions for their patio furniture inside one box, making it easier than ever to prepare for bad weather. We feel that the only real flaw with this box is that the included directions are a little bit challenging and tough to understand. Although it doesn’t take long to put together, the box is nevertheless a little bit confusing, especially since the included directions only feature pictures and don’t have any text instructions to help customers figure them out. It may take a little while to get the hang of which pieces go where, and since this item is so simple, we feel like this is a detriment to its overall use and design. Having help from another adult may make this process go more smoothly. This box is very sturdy and can’t be pulled or tipped over easily, which is especially nice for use around kids and pets. The box is very waterproof and doesn’t let anything seep through too badly. The company has been known to respond very quickly to any questions or concerns, even when products have arrived damaged (which is quite rare). The box comes well-packaged during delivery, which prevents it from being damaged often or arriving with any missing pieces. The box doesn’t become easily damaged by heat or humidity, either, due to its resin material. Some customers have reported scratches and breakage on arrival, although as previously mentioned, the company is good about responding quickly to these problems. The deck box may arrive without any instructions at all, which will make assembly even more confusing. Some customers have reported the piston mechanism on the lid becoming broken, damaged, or unusable sooner than the rest of this box, although that is not very common either. The box may be too large and heavy for some customers to move around easily, especially when it is full of outdoor items. It is possible for the box to crack and break over time with extended use. So what do you think? Do you feel like this deck storage box is a good solution for your outdoor storage needs? You can easily find boxes like this in all sorts of shapes and sizes, but we find that this is one of the better options out there because it’s deep and wide enough to keep all kinds of items you may want to have on hand for your outdoor adventures. If you have a small deck, a box of this size is going to take up a lot of the room you have to work with. You may not have space for other items, like chairs or tables, that you want to use outdoors. If you’re not able to move this deck box around when it’s full of items, this can be a problem. This is a big and heavy box that only gets heavier when it’s containing something. If you’re going to be taking your deck storage box inside during the winter, you’ll have to make sure you have room for storing it indoors or in the garage. Bigger boxes can be harder to find space for like this. In the end, the choice is entirely up to you. If you’re looking for lots of outdoor storage, however, you can’t go wrong with this great deck box!